For years, people could consume music at concerts, on the radio and TV, or purchase records or CDs. Today, the music industry has been turned upside down, and continues to evolve rapidly. Now, music is enjoyed through digital downloads from online stores like iTunes or Amazon, music and video streaming services, and satellite radio. As a result, the revenue streams for performers have fragmented, and artists need attorneys who know how to find sources of income and fight for their rights. Miami attorney David Bercuson has based his legal practice in this challenging entertainment environment. “You have to keep pace with the industry, understand the legal issues in today’s marketplace, educate clients and be an effective advocate. Every day is filled with different issues,” says Bercuson. 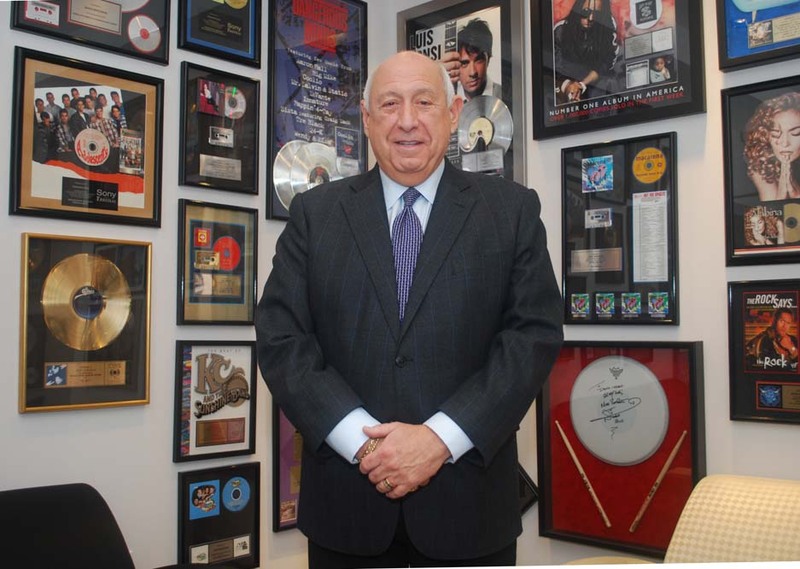 As an entertainment lawyer, Bercuson’s office is filled with gold records and memorabilia from clients including Flo Rida, Gloria Estefan, Julio Iglesias, KC and the Sunshine Band, Luis Fonsi and Trina. That’s because stars in the music, TV and film industries value his legal skills and expertise. “I won’t do anything without first discussing it with David, says Farruko, the Puerto Rican superstar with numerous gold and platinum singles and albums and music videos with hundreds of millions of views on YouTube and other video services. “I would find a way to give David a new lung if he ever needed one and preserve him like Walt Disney [in a cryogenic chamber] so he is always available,” says Farruko. Today, Bercuson is one of the most highly recognized attorneys practicing entertainment law in Florida. In addition to his music clients, his diverse clientele includes South Florida television personalities like Cristina Saralegui, Jim Berry, Eliott Rodriguez, Ambrosio Hernandez and Adamari Lopez. He has been named an AV Preeminent attorney by Martindale-Hubble for ten years, the company’s highest peer rating standard. He also serves as the vice chairman of the Miami-Dade Film & Entertainment Advisory Board to the County Commission. Known as a tenacious advocate for his clients, Bercuson is also experienced in domestic and foreign music licensing and obtaining recording or publishing deals for artists. “I’m fortunate in that my clients typically come to me by referral,” he says. “I assist artists who have disputes with companies and I regularly negotiate to obtain the best possible new or renegotiated contracts for the next stage of their careers in order for them to achieve their goals. Bercuson earned a bachelor’s degree at Tulane University and his law degree at the University of Florida. He and his wife Marla, who is executive director of business operations at the University of Miami’s Bascom Palmer Eye Institute, have two daughters and six grandchildren. Bercuson began his legal career as a commercial litigator, but transitioned to entertainment law with the rise of the local entertainment industry. One of his first clients was Disco CBS, which today is Sony Music Entertainment US Latin. He handled their litigation and negotiated contracts for artists and producers. He also gained experience in licensing agreements, music publishing and he has worked with organizations and companies around the world. Soon, in addition to musical artists, Bercuson would represent Spanish and English language TV anchors, sportscasters, as well as other personalities in all aspects of the entertainment industry, such as Dwayne “The Rock” Johnson. “I am not an agent or manager for my clients; I do their legal transactional work,” he says. A typical day for Bercuson might include negotiating a new recording, publishing or sponsorship deal for an artist, negotiating a contract for a TV news anchor, reviewing an endorsement contract for a top recording artist, or representing a young singer being courted by a record label. “The music industry is changing every day,” Bercuson says. “It is critical to keep pace with the market.” To help his clients collect royalties, Bercuson has become an expert in “neighboring rights” a source of income derived from public performances on the radio and “360 deals,” both of which concepts are relatively new but extremely important.